Seeing double? Not at all! You are indeed looking at two different things made of the exact same fabric! 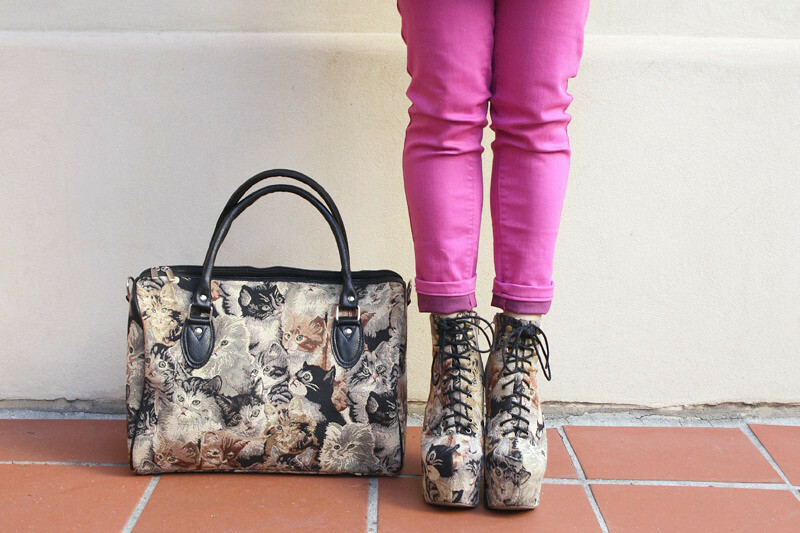 When Jeffrey Campbell first came out with these cat tapestry Damsel, I was ecstatic! I was so crazy about them that I had my two kitty cats pose with the shoes! 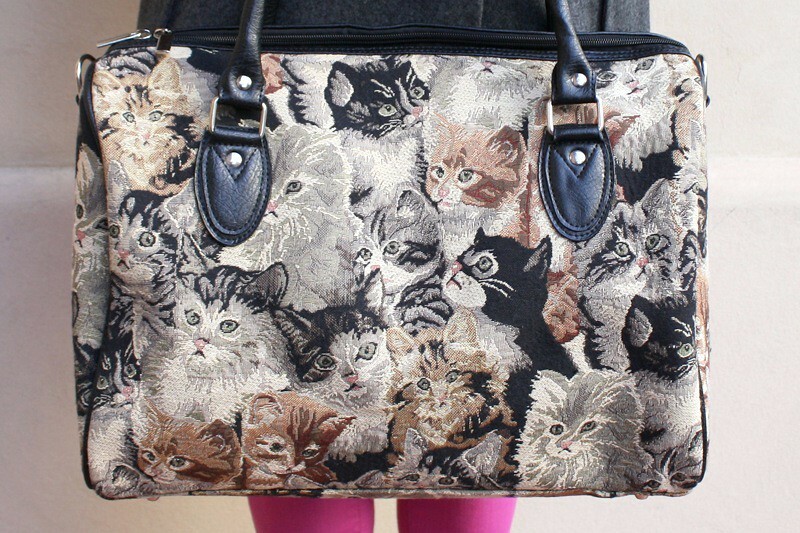 So you can only imagine my level of excitement when I stumbled upon this duffle bag made of the exact same cat tapestry a couple of weeks ago. I am so intrigued that the tapestry of the Damsel and the duffle are identical. Moving right along... onto my coat. I got this vintage coat last week, I was drawn to the half fur coat half peacoat look! Gorgeous genuine raccoon fur collar and sleeves with a wool bodice, I've never seen anything like it! 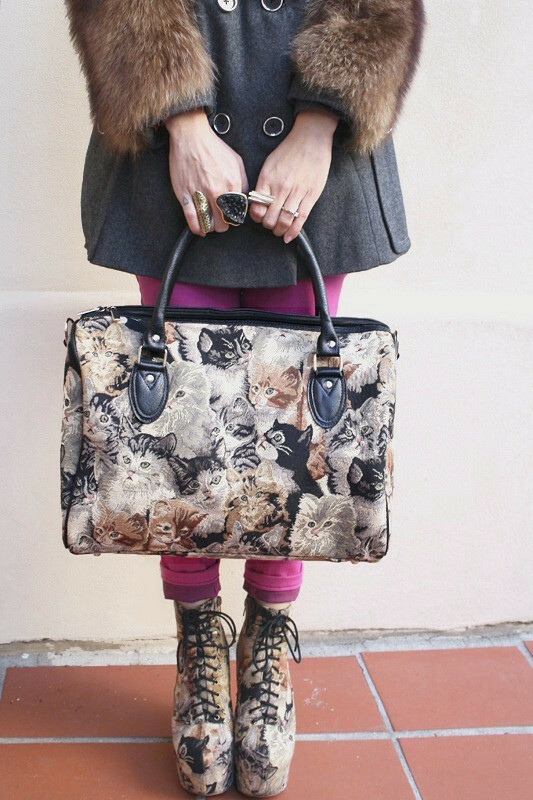 Cat Tapestry Damsel by Jeffrey Campbell from Eilatan. Vintage raccoon fur wool coat from Thriftwares. Quite amazing. It is the same pattern. that is the sweetest duffle! meow! :O :D that jacket is seriously the best thing ever. oh man. omg i have just spent ages looking through your blog! you style it so amazing!!! WHERE DID YOU GET THE BAG? !